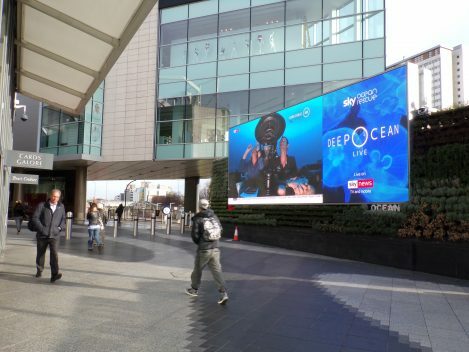 This morning a new DOOH campaign from Rapport has gone live, on which they have partnered with Sky, Mediacom and Ocean Outdoor to promote Sky’s Ocean Rescue initiative. From 8am-9am, Monday to Wednesday this week, Sky News will be broadcasting a 300m dive into the depths of the Indian Ocean, the least explored waters on earth. This is a world first, as there has never been a live outdoor stream from this far under the ocean before. The broadcast will be live-streamed on DOOH sites across the country, including Stratford Westfield, Canary Warf, Printworks Manchester, St. Enoch Square Glasgow, and more. The live documentary series will shine a light on the undiscovered extent of human impact on our oceans, with part of the series showing how people are working to find solutions and combat the issue. The concept for this project came from Rapport, who chose to partner with outdoor advertising company, Ocean Outdoor, as they also have their own plastic initiative, Ocean for Oceans, whereby they work to end the use of single-use plastics, encouraging the world to do the same, by working in partnership with their clients and partners. This entry was posted on Monday, March 18th, 2019 at 11:27 @518 and is filed under DailyDOOH Update. You can follow any responses to this entry through the RSS 2.0 feed. You can leave a response, or trackback from your own site.